Erwin Straznicky was born on 16 January 1916 at Wien in Austria. He joined the Luftwaffe pre-war and received his flying training at the Jagdfliegerschule Schließheim. At the outbreak of World War 2, Straznicky was serving with LG 2. Leutnant Straznicky was assigned to 3. (J)/LG 2. He participated in the Battle of Britain recording his first victory on 23 June 1940, when he shot down a RAF Hurricane fighter near Calais. At the conclusion of the aerial battles over England, Straznicky had three victories to his credit. Straznicky participated in Operation Merkur, the invasion of the Balkans, with 2. (J)/LG 2. He did not add to his score during this period. By the end of May 1941, I. (J)/LG 2 was based at Belgrad. The unit moved to Rumania to prepare for the impending operations in the east on 18 June. On 22 June 1941, Operation Barbarossa, the invasion of Russia, commenced. Oberleutnant Straznicky, now serving in the Stabsstaffel of I. (J)/LG 2, claimed a Russian I-16 fighter shot down on this day to record his fourth victory. Straznicky transferred to JG 77. He was assigned to 6./JG 77. By the end of 1941, he had raised his victory total to 12. On 1 March 1942, Oberleutnant Straznicky was appointed Staffelkapitän of 2./JG 3 then forming at Wiesbaden as part of the formation of a new I./JG 3, the previous I./JG 3 having been redesignated II./JG 1. He recorded his 20th victory on 31 July, when he shot down a Russian Yak-1 fighter. He recorded 10 victories in August, including his 30th victory on 1 September, a Russian LaGG-3 fighter. However, Straznicky had been obliged to force-land his badly shot up Bf 109 F-4 (W.Nr. 13 388) near Gorodischche following aerial combat on 24 August. He was fortunate to escape injury. By the end of September, Straznicky had increased his victory total to 35; most them gained in the bitter fighting over the beleaguered German army at Stalingrad. 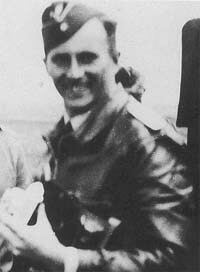 Straznicky was shot down in aerial combat with Russian Yak-1 fighters near Satow, 50km north-northwest of Stalingrad on 3 October 1942. He was listed as missing when he failed to return in Bf 109 G-2 (W.Nr. 13 663) “Black 16”. He was posthumously awarded the Deutsches Kreuz in Gold on 29 October. Erwin Straznicky was credited with 36 victories. Included in his victory total are seven Il-2 Sturmovik ground-attack aircraft.